People who Knit Too Much. Amy Karol's Bend The Rules Sewing is on my work table this week. I'm thinking of making myself the "Heidi Headband" just for kicks. I Have Always Loved You or "Typeface Matters"
I started out the summer with big ideas. I was going to sit in the shaded cool of my gazebo and escape into the pages of Prokosch, Voltaire, and Goethe. Maybe I'd put the book down from time-to-time, sip on an iced chai and dreamily remember the summers of my youth. Of course that never happened. I did do quite a bit of reading, but the smoke kept me inside and my books led me on a different journey than the one I had planned. Instead of the strained socio-political musings of Dead White European Males, I wound up with a batch of books about complicated relationships of all kinds. Lets start with Stephanie - the narrator of 1968's Lovers and Tyrants. She begins her story, "I shall never cease to marvel at the way we beg for love and tyranny" and continues with a miserably accurate picture of the disappointments of married life. A magnifying glass held up to the parts that each of us will recognize but might choose not to bring into focus. And definitely keep ourselves from muttering out loud! Stephanie believes that accepting shelter from a man is the same thing as accepting a life of servitude. The author, Francine du Plessix-Gray is only ruminating on the changing roles of women in the late 1960's, but if you're at all unhappy in your relationship, don't read this book. It's depressing. Somehow, Lovers and Tyrants led me to Palace Walk, the first of Najib Mahfuz' Nobel prize-winning "Cairo Trilogy." This is the story of a wealthy, conservative Muslim family living in Cairo during the mid-1900s. The city is under British occupation and the city is on the verge of rebellion. The book was published in the 1950s but only recently translated into English. A great translation it is, too. In Palace Walk, the position of Muslim women connects noticeably to the questions about shelter and servitude asked by du Plessix-Gray in Lovers and Tyrants. But perhaps more interesting for me was the issue of voice throughout the novel. The characters asking themselves - what can and cannot be said in a marriage? A business relationship? Between parent and child or citizen and military occupant? Who can (or cannot) speak and for whom? How does what we choose to say (or choose not to say) change the course of our lives at home, and just as important, the political future of the country? Important questions for now. Several weddings take place throughout Palace Walk. So delicious to read those joyful threads. So often what we read about the Middle East is devoid of cultural sensibilities; broadbrush criticism with little understanding for the beauty complexity of every day life in these places. But by far, my favorite summer read was the recently released translation of Per Petterson's novel, Out Stealing Horses. A MUST READ. It took me just two days to read this book, and I think it would have been better if I'd had the time to read it straight through. Not being forced to break away from the steady, quiet rhythm of Trond's thoughts, the main character who thrives on the routines of his solitary life. After the tragic death of his wife, Trond returns to a summer cabin in the Norwegian forest where he logged with his father as a boy. And its no surprise he goes back there after the death of his wife. It was there that his father taught him, "Trond, you can decide when it hurts." Out Stealing Horses is the story of family life as Trond remembers it, weaving the past in with the present chapter by chapter. At first it seems as if nothing much is happening at all. And then, just like our own lives, you look back and the story unfolds in front of you and makes perfect sense. As if you should have known all along. What you've done wrong or right; missed connections, the mind tracing the foggy paths of what might have been. "Only a little bit in your soul?" "Let it sink, Trond," he said. "just leave it. You can't use it for anything." I've been working on hand made books in the art studio this week, getting ready to add layers of collage to some of the structures I've created. For inspiration, I thumbed through my copy of Altered Books an d was reminded of how much I like the handmade books by the artist Jane Maxwell. For this little book, Maxwell used old sewing patterns, paper dolls, and a thin layer of beeswax. "Cherries" and "Pears and Circles" are two more recent pie ces and they both really inspire me. And a coincidence that I'd already been thinking out "cut-out" collage a la Christian Holstad. 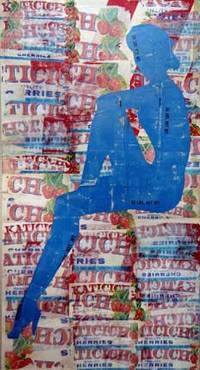 Check out Jane Maxwell's website to see her wax assemblage and more fruit label collage work! "People like it when you tell them things, in suitable portions, in a modest, intimate tone, and they think they know you, but they do not, they know about you, for what they are let in on are facts, not feelings, not what your opinion is about anything at all, not how what has happened to you and how all the decisions you have made have turned you into who you are. What they do is they fill in with their own feelings and opinions and assumptions, and they compose a new life which has precious little to do with yours, and that lets you off the hook." I've felt this way all my life, but have never been able to articulate what Per Petterson was able to do in a single sentence. I had to have the book. I'm often disappointed by art and craft stores in my area, but every on ce in awhile, Montana will up and surprise me. Last Saturday, detoured by a forest fire, I happened upon a Costco-sized scrapbooking store housed in a dull, warehousey-looking building you wouldn't think had anything to do with arts and crafts. I don't consider myself a scrapbooker, but... wow. That store has everything a collage artist could ever dream of: handmade papers, archival inks, pigments, glues and tape, rub on transfer letters, transparencies for layering and every paper punching/cutting/burning/tracing tool you could possibly imagine. Needless to say I promptly spent $150. Then came back the very next day and spent $50 more. So the point of that long story is that I've been fooling around with handmade books in the studio ever since. So far, I've made three different versions of this 6" x 6" "exploding" book. Next project? 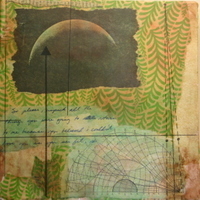 To integrate collage and text into the structure and make an exploding artist's book. Maybe based on a poem....we'll just have to see what happens. 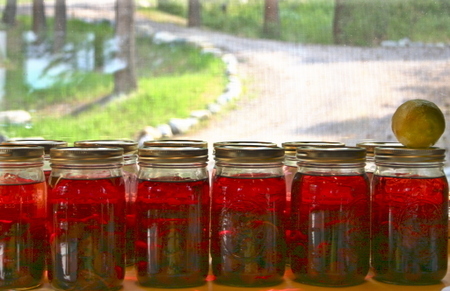 Edit: After I saw Adrienne's post this morning, I have an idea about what I will make next! Some kind of a map book to refer to when I can't find my way. A list of truths about myself, quotes, art I like, memories that make me happy. Stay tuned. Photographers Yves Marchand and Romain Meffre have created an eerie portrait of a crumbling city in the series, "The Ruins of Detroit." 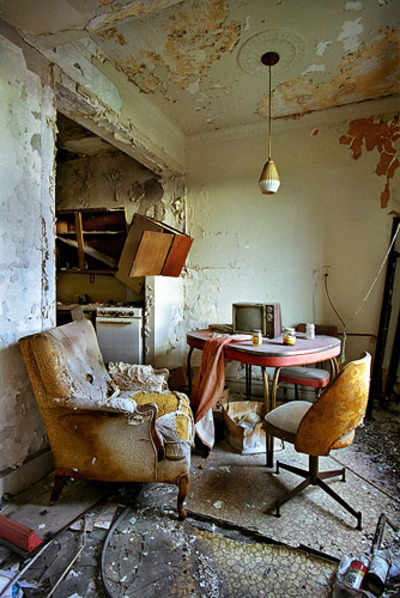 Spend some time exploring their site, Photography of the Unexpected and Neglected Architecture. 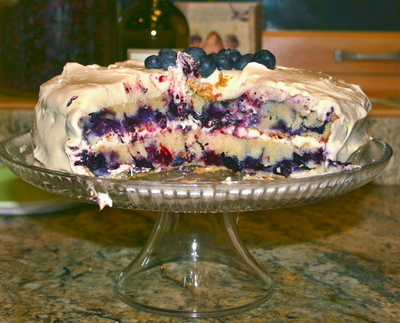 The lemon-blueberry combination was summer on a plate. You've got to try it. I always make time to read Wisecraft. 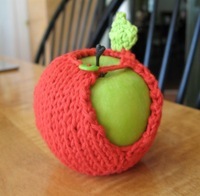 It's a great craft blog and Blair always inspires me in unexpected ways. My sister and I tried Wisecraft's "Hot Rocks" project earlier this week and we had a blast! 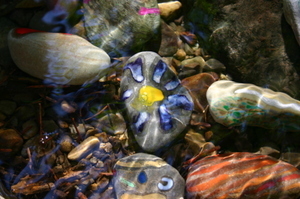 We found a shallow, sunny pool in the creek and installed them under water. I will love seeing them each morning on my walk up to the art studio. A few years ago, I went to Harvard for a job interview and got really lucky. I didn't get the job but wound up with an afternoon free of appointments and plenty of time to head over to the University's Busch-Reisinger Museum. The museum holds some of the world's finest examples of German expressionism as well as a comprehensive catalogue of Joseph Beuys' work. Supervised by a curatorial assistant, I was allowed to select some of the Beuys' multiples from the archives and have them brought out to me in the study room. At that time, I was interested in how artists were using materia ls like essential oils in assemblage to engage the viewers sense of sight AND smell. So I chose Postcards 1968-1974, which incorporates beeswax, and Smell Sculpture, 1978, which soaked letters in a preserving jar with rosemary, thyme, and lavender oils and a scoop of wheat germ. I t was a great day, and I've never forgotten it. So when I came across a "Beuys Bunny" for sale at das kaninchen, I snapped it up for the sake of my memories. das kaninchen's bunnies refer to Beuys' most famous and most controversial piece of performance art, How to Explain Pictures to a Dead Hare (1965). For Dead Hare, Beuys covered his face in honey and goldleaf, then wandered Dusseldorf's Galerie Alfred Schmela carrying a dead rabbit in his arms. As he walked, he appeared to be explaining art in the gallery to the rabbit. Many consider(ed) Beuys to be a charlatan, but regardless of what you think of his creative abilities, interest in his work endures. 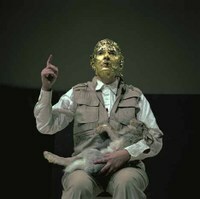 Dead Hare was reenacted as recently as 2005 by Marina Abramovic as part of "Seven Easy Pieces" at Guggenheim New York. The honey used in Dead Hare also symbolised something significant to Beuys. He considered honey to be a spiritual food that contained particles from every part of the environment - sun, plant, and mineral. He considered bees a "venus cult" and the only link between earth and heaven. "Art is not there to provide knowledge in direct ways. It produces deepened perceptions of experience. Multiples are often just suggestions. You can describe a thing, say something about its intentions. That's how to get closest to the pure that leaves something in the things so they can have some effect. There is a more in them that means they appeal to more than understanding." Not everyone you meet has your best interests at heart. I've disappointed more friends than I care to count. True love is a rare, euphoric rollercoaster ride of joy, laughter, tears, disappointment and deep connection. Sometimes all in the same day. You haven't ever been loved - really - until you've had a dog. Everyone likes music by Prince, even if they won't openly admit it. I've never felt more freely blessed than that Georgetown morning, painting the Washington Monument from the roof of the dorm. Bacon frying next door at Mother's. My senior year. I was past some problems and hadn't yet encountered the next set. The memory of that time is now my reference point for what is right and wrong with my life. It is best to avoid a sedentary lifestyle. There are all kinds of friends. Not all of your friends will be willing to sit beside you during hard times. Some are work friends, some are book friends, some simply just want to go shopping together. They are all worth keeping, but you will have fewer disappointments in life if you start off with a reasonable understanding of each friend's emotional limits. Good quality hair products are worth the money. I am afraid of rejection, heights, dying alone, losing someone from my family unexpectedly. You can have too many ideas. Diet Coke just makes you want to eat sugar. It is never too late to apologize to someone you've hurt. With the exception of my sister, no one in my family reads my blog. Sobo glue is the simply the best all purpose art and craft glue there is. There are better glues for specific purposes, but Sobo is the one you should carry in your purse. I love unexpected days of bad weather - it's gives me time to make things - bake, make art or crafts. --Inspired by Amy Krouse Rosenthal's book Encyclopedia of An Ordinary Life. Our yard is quite literally swarming with birds displaced by nearby forest fires. Five or six times a day, I hear the gut wrenching sound of a bird slamming into the living room window. Some, like the little yellow one, are stunned but eventually recover. Good to Bad Mood - Click on it! 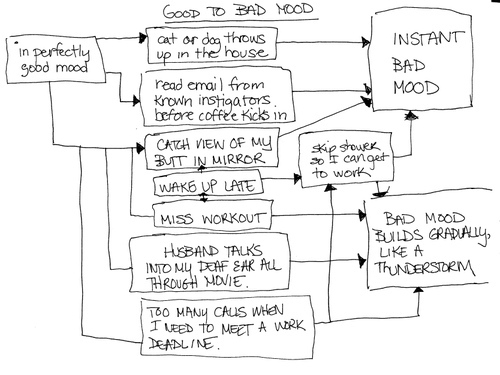 My bad mood flow chart was inspired by one in Amy Krouse Rosenthal's book Encyclopedia of An Ordinary Life. Two months later, I've finally completed "The Kidnapper" from Aranzi Aronzo's The Cute Book. The pattern and instructions were simple, and I had him finished in about three hours. 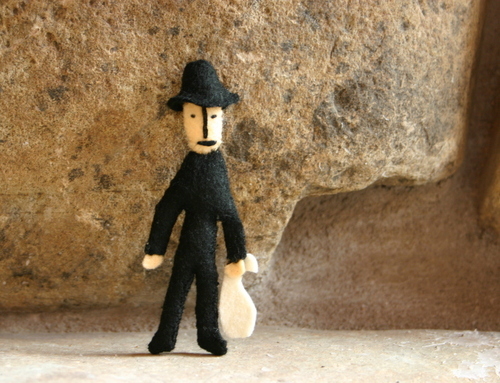 He measures about 3" high and I have to say, standing in front of this miniature cave on my fireplace hearth, I think he looks pretty sinister. After a story about Montana forest fires appeared on the national news last night, we've been getting lots and calls and emails from friends and relatives. The fires are serious this year, but we expect that our area will be o.k. The closest fire to our house is about sixty miles away on the other side of the lake and is considered to be "contained." The wind does bring plenty of smoke and ash our way, however, and I thought you might like to see what the air looked like around here a few days ago. This spiderweb has caught plenty of ash. These photos were taken in mid-afternoon. The heavy smoke on the western side of the lake shut out sunlight up high - creating long, long shadows and a yellow tinge to the air. Chilean artist Alfredo Jaar's Geography = War, 1991 illustrates the tragic tale of events in Koko, Nigeria in 1987 and 1988. That year, five Italian tankers arrived in the port city carrying toxic wastes, including the carcinogen, PCB. Unaware of the contents of the barrels or the risks associated with the chemicals they held, a farmer agreed to store them on his land in exchange for $100 a month. Some of the barrels eventually exploded in the heat, others were emptied by neighbors. Local residents who reused the barrels experienced chemical burns, premature labor and delivery and even death. Jaar's Geography = War, 1991 consists of fifty-five barrels of water installed in a silent, black room at Chicago MOCA. 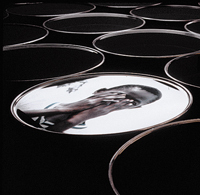 Light boxes projecting photographs of the citizens of Koko are suspended from the ceiling, and can be seen in the reflections of each water-filled barrel. On occasion, the viewer is confronted with a glimpse of themselves in the water. It suggests that Jaar wants to juxtapose our life experience - the affluence of the West - alongside that of the Third World. A suffering, oppressed population that when forced to choose between poison and poverty, is forced to choose poison. I've had a postcard of Bloom, 2005 on my sewing table for months now. 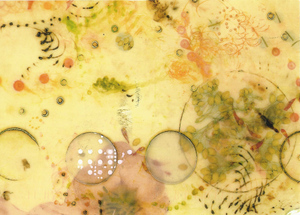 Philadelphia artist Lorraine Glessner combined encaustic techniques with photographs, digital prints, paper, oil paint and fabric to get this beautiful 12 x 12 collage. It's worked itself into my subconscious somehow.After months of wondering how all this sewing and art might fit together, some ideas are finally starting to take shape. 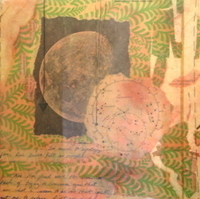 I fell in love with encaustic collage at my workshop with Miranda Lake at Anderson Ranch back in early June. Before leaving the Ranch, I busted into the digital lab and ordered several hundred dollars worth of wax and oil sticks so they would be waiting for me when I got home. Fifteen minutes after my plane touched down in Missoula, I hit Lowe's and bought myself a pancake griddle, a set of utility brushes, and a tarp to protect the new bamboo floor in the studio. Not even two hours after I returned home, I was SET UP. So - somewhat of a surprise that I haven't even touched my encaustics since I unpacked them from their shipping box. But finally this week I got tired of making up excuses. I whipped this pair of collages out of the closet and waxed them just to see what they would look like. Both pieces were completed several years ago when I still lived in Miami. They measure 10" x10" each, and use vintage shelf paper [stolen] from a dresser at Douglas Gardens thrift store in Miami, old sewing patterns, scraps from personal letters, and sheets from an old astronomy book I found in pre-storm New Orleans. It feels good to have an impermeable seal over all of that - you can look at it but it can no longer be touched. Last weekend my knitting group took a tour of the Going to the Sun Fiber Mill owned by Scott and Diana Blair. The mill accepts fleece from sheep, goat, alpaca, llama, yak and bison. Fiber is sent in by customers from all over the country, and each batch is hand processed by the crew at the Mill. Diana walked us through the mechanics of the process, and I can promise you, it will give you a new appreciation for the work that goes into hand spun yarn! The fleece is first hand cleaned, then carded by machine. The fib er is then carded a second time, and extruded into "roving". The roving is in a tube shape which can either be spun into yarn, pulled apart for needle felting, or twisted and knit "as-is". Spun yarn is then wound into skeins on a winding machine. 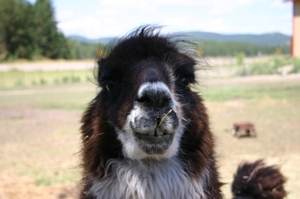 Going to the Sun Fiber Mill also sells luxury fibers and yarns made from alpaca and llama raised on their own farm. If you're interested in hand spuns, you may also want to check out another Montana company called Mountain Colors. Everyone in my knitting group has been mixing Mountain Colors' beautifully hand-dyed and spun "Mountain Goat" with "Moguls" to make bobbled hats and mittens.